From Bumpkins Finer Baby Products. 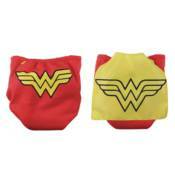 Your superhero baby can fly into action and take on the world in this super cool DC Comics Snap-In-One Cloth Diaper with Detachable Cape. Includes a soft, detachable Minky insert that snaps in to the diaper for comfort and to keep your baby dry. MONKEES MONKEEMOBILE 4.5 IN VINYL FIGURE WONDER WOMAN & BATGIRL DC BOMBSHELLS VYNL.